Our parents always told us to go to college so that we could learn to use our heads instead of our backs. We did that, and we learned that it’s not an either-or proposition. Using your own two hands is the best way to craft a quality product. Using your back to grow organically, steadily and sustainably is the best way to scale. Most importantly, using your heart is the best way to infuse a little happiness into the world. We’ve chosen to use our hands, our backs and our hearts and do things “The Hard Way”. Every bottle we produce has been chopped, cooked, bottled, labeled and packaged by hand in our own facility. We believe that this dedication to the detail of the craft consistently produces results that speak for themselves. But don’t take our word for it – try a bottle or two for yourself and explore our commitment to quality on your own. Delicious sauce is an craft, not a commodity. As our company and product line continues to scale, we are committed to the craft of making delicious high-quality products first and foremost. Our sauces are designed to deliver maximum flavor — with heat. 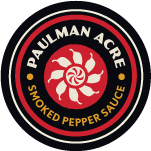 While we certainly appreciate the spicy side of life and we even do some dabbling with the super-hot end of the pepper spectrum, our primary focus is on flavor. Always. No concentrates, oils or extracts. We use peppers in our sauces. We do not use any capsaicin concentrates, oils, extracts, crystals or anything of the sort. We use good old fashioned peppers of all shapes, sizes and heat ranges. We like super-hots as much as the next chile-head, but the upper limit of our sauces is governed by the peppers themselves. Ego can be a double edged sword. While we certainly take pride in our work, we also know that life is too short to get too worked up about the bummers. We are pranksters at heart and always aim to retain our humor and humility.